The bulk of the just over 20,500 miles we put on the car were during trips that were more than 100 miles one-way, including one relocation from Washington, DC to Boston, MA plus our cross country road trip. When used in this manner, the TSX returned a running average of 24.93 miles per gallon at an average speed of 31 mph. Despite owning it during one of the highest gas price periods in recent history, the fuel cost per mile was only $0.16 and accounted for roughly one quarter of the overall ownership cost of $0.67 per mile. When driven carefully, we eked out 547 miles from a single tank of fuel and maxed out at just under 30.5 miles per gallon, edging out the EPA rated 29 mpg, but when pressed hard, a single tank only took us 348 miles and turned in a paltry 20.2 miles per gallon. Still, for a 3,400 lb sedan without direct injection or a ridiculous number of gears, real world fuel efficiency proved excellent. Behind the wheel, one of the things that was both a plus and a minus was the utter simplicity of the interior. Unfettered by the presence of a touchscreen infotainment system or any sort of advanced display, the TSX felt distinctly anachronistic in an era where nearly all the competition come with some kind of display in the center console. This meant an ease of use unmatched by most of the cars in its class, but also left me feeling a little let down by the lack of technology, especially some of the more basic things that have become a necessity because of how aerodynamic needs are requiring cars to have taller and taller rumps. Another disappointment came in the form of the tiny looking wheels, which never quite offered the right stance that the TSX deserved, especially since Acura's notorious wheel gap was ever present and unfixable without significant investment. While these might seem like minor details, it is these little details that win over consumers and keep them coming back to a brand. 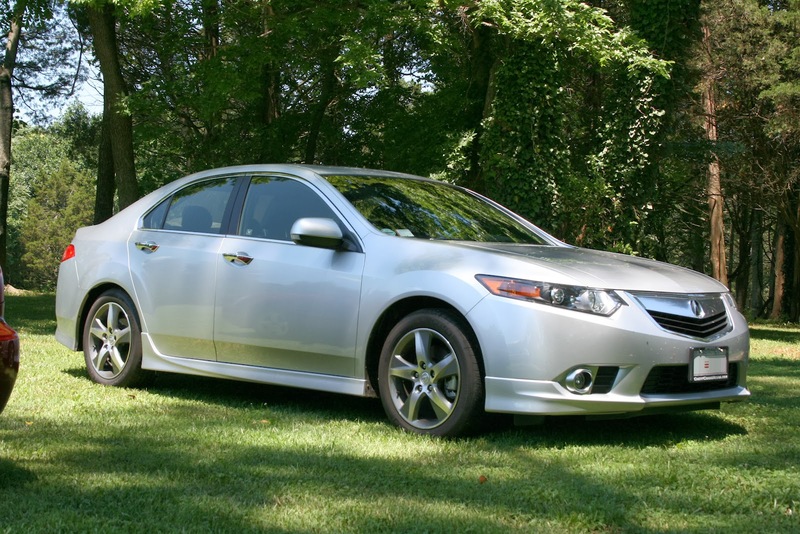 Where the TSX did not disappoint was in its driving dynamics. Every time I climbed into the car, I left with a smile on my face. Part of that is because the performance of the TSX is so accessible, allowing even average drivers to be able to push the car safely to 8/10ths without fear of overstepping their driving abilities (that last 2/10ths takes quite a bit more talent to access as the understeer starts to get prohibitive). Being able to access so much of the car's potential at lower speeds also meant even the most mundane drive could be made entertaining. Acceleration is brisk and feels quicker than a 3,400 lb car with a 201 hp naturally aspirated engine has any right to feel, helped in large part by that exceptional manual transmission. Steering, while not quite as razor sharp as the hydraulic unit in the 1st generation TSX, is among the best electronic units in the business and offers a good balance of feel and isolation while remaining well-weighted and communicative. Spring and damper rates are well matched and while the ride, on the firm side of comfortable and the soft side of sporty, is a good compromise in a car that saw a lot of miles cruising the open road. At the end of my time with the car, there were certainly pangs of separation anxiety. While it was not the most attractive car on the market, it was such a well-balanced sedan in so many other ways. This is my third TSX in the last decade and the combination of performance, comfort, and low cost of ownership made the time with it feel like spending time with an old friend, albeit one that has had a slightly botched rhinoplasty and packed on a few pounds in the last few years. When I recently drove the TLX, the TSX's successor, that same sensation is lost as everything about the TLX feels muted by comparison. In many ways, parting ways with the Acura brand with the TSX as my last impression is a good way to go. It allows me to recall the brand fondly, even if the car had its share of minor foibles. Short of a fully custom build, no car is ever perfect, but to me, the TSX will always feel damn close. Click here to read update #4.